The city of Novy Urengoy. Drivers in the coldest regions make blankets for their car engines, and some even keep the motor running from autumn until spring! In many Russian regions harsh winters are the norm – people and their cars have no choice but to adapt. 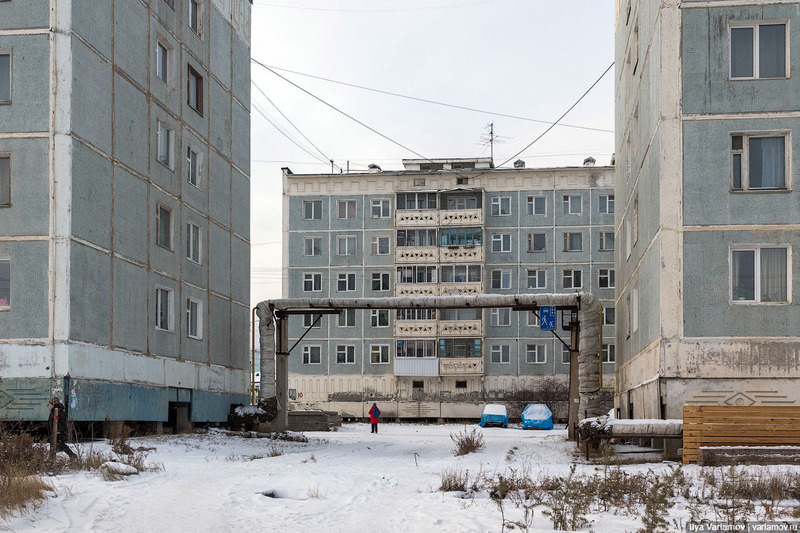 Yakutsk, Norilsk, and Vorkuta can get so cold that it’s incredible anyone chooses to live in these places at all. 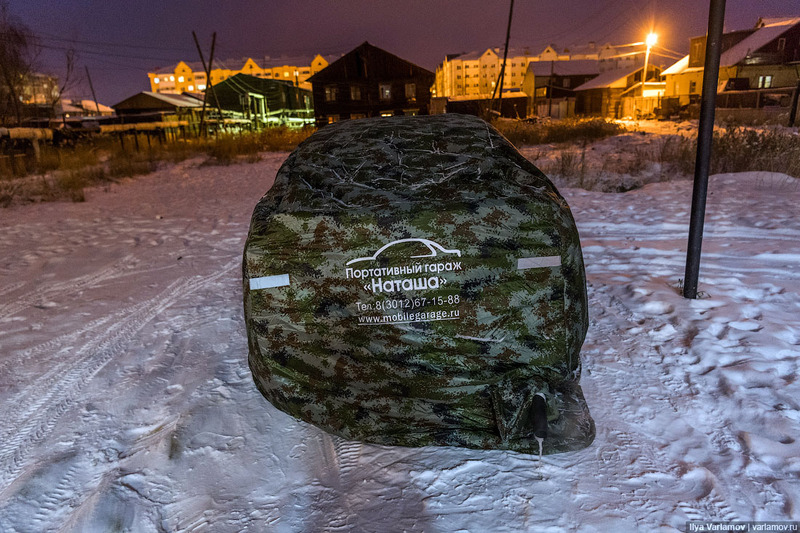 In Yakutsk, for example, temperatures can drop to -30°C by mid-October, so most locals "mothball" their cars (i.e. take the battery out) and leave them outside until spring, switching to public transport in the interim. And if you think heated garages are common, you’re mistaken. Because of the permafrost there are no underground car parks in Yakutsk. Some newly-built apartment blocks have parking spaces on the ground floor, but this is rare. As everywhere, city residents park their cars on the street, which means starting their motors can be a real problem when it is -50°C outside. In the north, drivers fit parking heaters like those made by Webasto to their engines. Getting one installed in Yakutsk costs about 35,000 rubles ($530). The system is switched on remotely and after an hour or so the car should be ready to start. In Novy Urengoy people install power outlets by their parking spaces, but this is not particularly safe. The most radical method is avoid turning the engine off at all from autumn onwards. This is what many car owners do here: from October until April they park their car with the engine running, leaving the key inside and the alarm on, using a second key to open the car when they want to get back in. "Who will steal it in -50°C? There are not many people around when it is so cold," Sergei Permyakov, an architect from Yakutsk, explains. It’s better to leave the car on a slight slope so that water doesn't collect in the exhaust, otherwise the engine will stall and starting it again will be difficult. One major disadvantage of having the engine running all the time is the fuel consumption. Also, if a car is parked for a long time in the cold, its wheels become deformed: As the locals joke, they become square. Warm portable garages are not cheap but very useful and normally come in the form of quilt covers that are stretched over the car’s body o prevent it from freezing. They cost between 6,000 and 20,000 rubles, depending on the size of the vehicle. "When a car is not used for a long time, the cover is stretched over it and tightened at the bottom, and a rubber pipe is put on the silencer to vent the exhaust gas. The car doesn't cool down and so can be used all winter," according to Larisa from Yakutsk. "The cover for my car (a Toyota Vitz) cost 11,000 rubles ($170). It takes five to 10 minutes to put it on and even less to take it off." Look how beautiful Yakutsk is in the winter! When temperatures fall below -40°C, the city is covered in an icy fog, it’s like driving through milk. And – just imagine! – in such poor visibility drivers still cover their side windows from the inside with a special film that keeps the heat in. Admittedly, you can't open the windows with the film on, but who would want to do so when the mercury is so low? Many drivers install a second external windscreen to prevent the main one from cracking when driving, and many stop using wipers in the winter altogether. When it’s -50/-60°C outside, an unprotected car freezes within minutes: all liquids inside thicken, the rubber parts become brittle and fall apart, and the windows get iced up. So many drivers start insulating their car from autumn onwards. At car service centers this work costs about 500 rubles ($7.5), says Larisa. "The silencer is covered with mineral wool and the bottom of the car with tarpaulin. And the engine is protected with felt or an "auto blanket" – this allows it to warm up faster and stops it from cooling down too quickly in the cold. Some DIY enthusiasts even make blankets for the battery. Felt is also used to keep the floor inside the car warm."